Just a short stroll from the centre and offering a host of impressive amenities, this modern 4 star hotel provides and ideal base for a short or longer break of business or holiday travel. 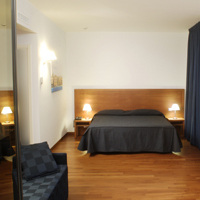 The hotel is sitting near the autoroute exit , and in front of the Pala Ilio ( sporting palace). The hotel offering an high service, with a breakfast buffet with a lot of typical products, american bar, office corner with internet/fax/phone, reading corner and Tv with DVD and Sky TV, parking. Location is perfect for excursions to the Egadi Islands, Mothia, Erice, Se gesta,Mazara and Marsala.